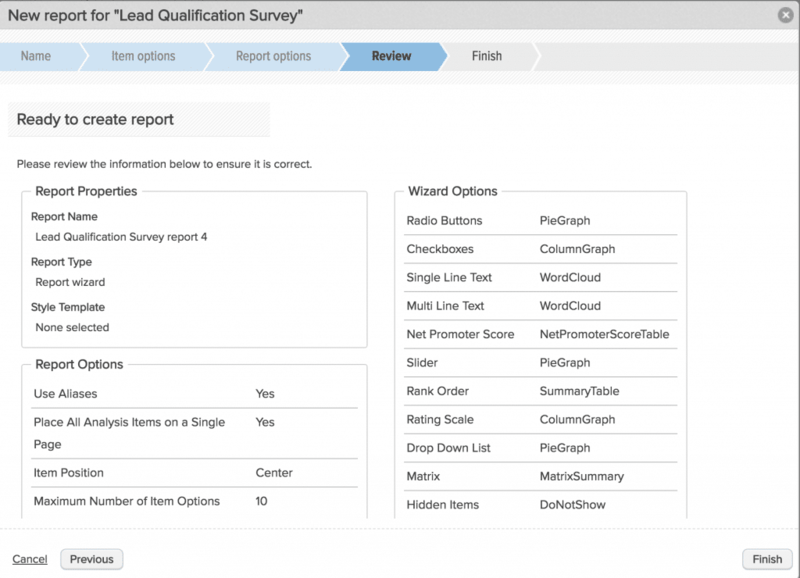 This guide focuses on the Report Wizard feature – a way to generate a report quickly, while still having some customization options. 1. 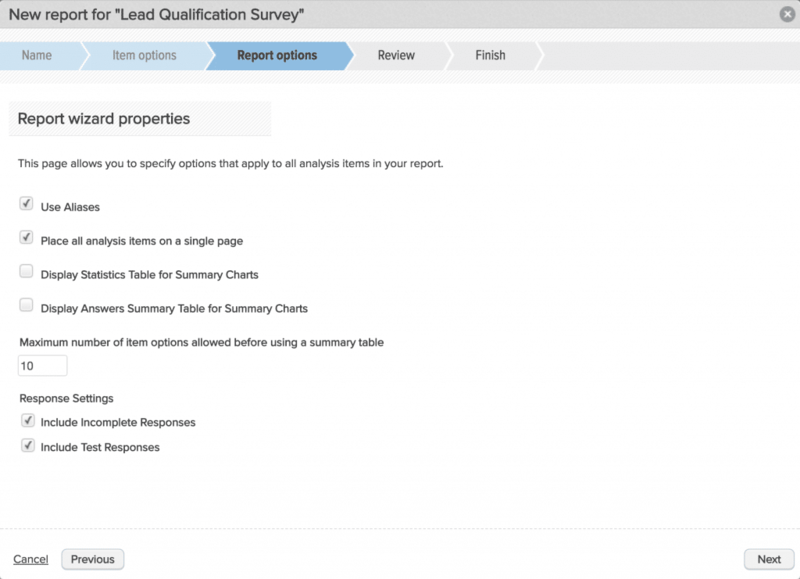 From the survey dashboard or survey editor, click the Analyze -> Reports -> Custom Report. Give your report a name. This will only be shown to you as the admin. Under Report Type, choose ‘Report Wizard’. Choose a Style Template from the drop-down list (optional). Choose if you’d like to display the title of the survey on your report. The Report Wizard works by “mapping” certain chart or graph types to the survey question types in Checkbox. In the item options step, you will choose which graph type to apply to each question type. TIP: You can streamline this process by saving your preferred report settings under System Settings -> Report Settings -> Report Preferences. In the example below, the results for all Radio Button questions in your survey will be displayed as Pie Charts in your report, the results for all Checkbox questions will be displayed as Column Graphs, and so on. Select Next to continue. Select Previous to return to the Step 1. 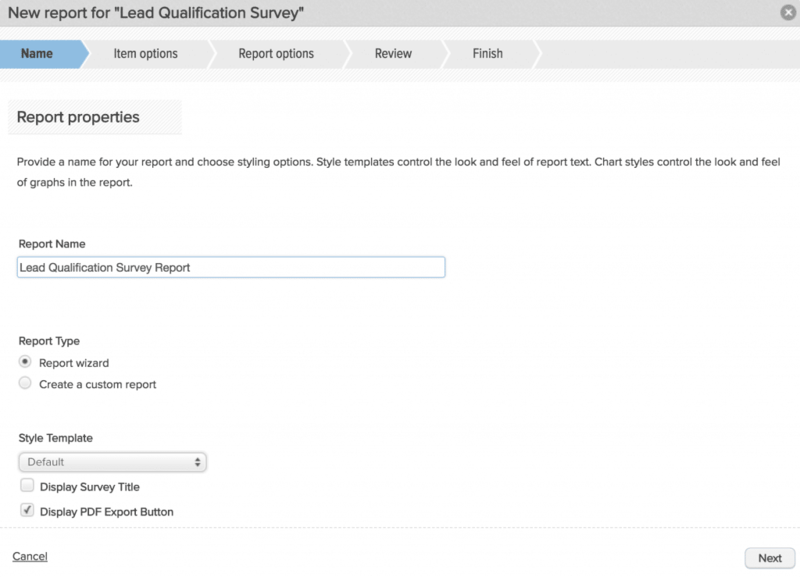 The next step will give you some additional display options for your report. Aliases are alternate question and answer texts that are created in survey item editors and can be enabled when generating reports and exports. If you included aliases in your survey, you can enable them in your report by checking the Use Aliases option. Doing so will replace question and answer text with alias (alternate) text in the report. Check the second box to place all report items on the same report page to create a one-page report. 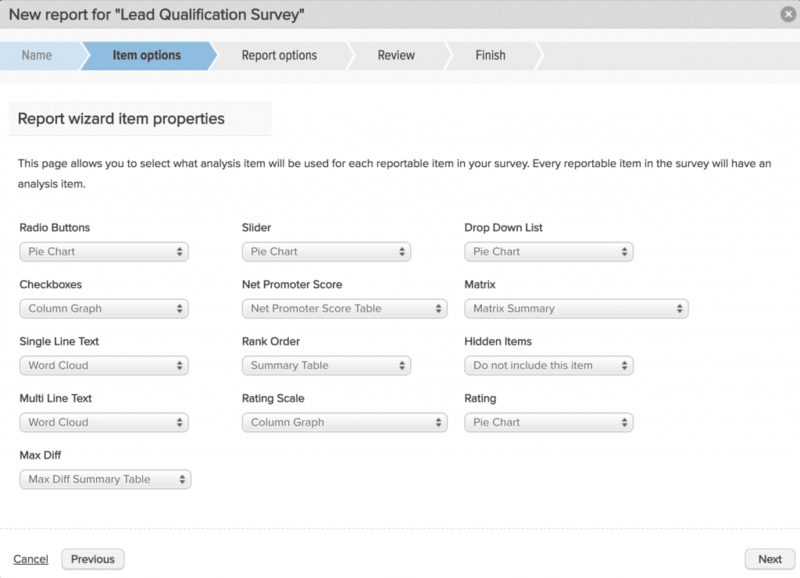 If this box is left unchecked, the report pages will mimic those in your survey, e.g. a 3-page survey will generate a 3-page report. Check the third box to display a table with the total response count below each chart. Check the fourth box to display a table summarizing answer distributions below each chart. Set the maximum number of item options (answer choices) allowed in a chart before switching to a summary table display. This feature is useful when displaying results for a question with many answer options. The Response Settings allow you to include or exclude your Test and Incomplete responses in your report. Click Next to review your report settings. Select Previous to return to Step 2. NOTE: After a report is created, report pages and item locations can still be changed in the Report Editor. Review your report settings. 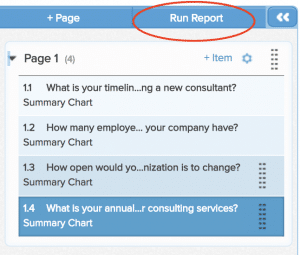 Click Back to make changes or Finish and then Run to complete and run your report. 1. Once you create and run a report using the Report Wizard, you may decide that it doesn’t look exactly the way you want. Don’t worry, you can still make edits or add additional charts or messages to it once it’s created.